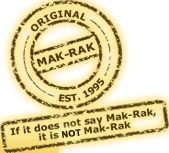 Interested in owning your own Mak-Rak franchise and sharing in our success? Please complete the Franchise Enquiry form to the right or for more Franchise Information click here and we’ll get back to you. On request the prospectus or any further documentation will be sent by our consultants.